Gandhi's Be Magazine chose author Ivan Figueroa-Otero, MD as a Global Change Maker, and invited him to participate in this conference-retreat to discuss his next book, "Spirituality 103: The Forgiveness Code, Finding The Light In Our Shadows". Dr. Ivan Figueroa-Otero writes of a journey of love, compassion, and forgiveness we must all take as we truly embrace our inner Warrior of Light. Dr. Ivan Figueroa-Otero, a retired Pediatric Surgeon who now dedicates his practice to the application of Chinese Medicine and Acupuncture in San Juan, Puerto Rico, will be one of the prestigious guest speakers at the 1st Global Partnership's Spitirual Retreat , organized by The Sacretherapy Institute's UR2.Global project and Gandhi's Be Magazine. 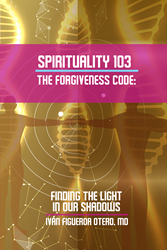 Dr. Figueroa-Otero's pending publication of his third book, Spirituality 103: The Forgiveness Code, Finding The Light In Our Shadows, coming out in April 2017, is the reason for the invitation to talk at the retreat. The book is the third in the Spirituality Of The School Of Life series, preceded by Spirituality 101 and 1.2. The author received many reviews and awards by organizations like the National Indie Excellence Awards, Reader's Favorites, USA Best Book Awards, Storyfinds, Focus On Women magazine and the Kirkus Book Review, among others. “To be chosen by Gandhi's Be Magazine as a Global Chance Maker is one of the best recognitions I've had in my career as an author. It confirms that the world is ready for my message, and I'm eager to be at Machu Pichu giving my conference at the Spirituality Retreat. It's an opportunity to talk face to face with people that are receptive to global changes, about how we can be co-responsible for the effects those changes will entail for us and those around us," days Dr. Figueroa-Otero. On their part, Missy Crutchfield and Melissa Turner, founders and editors of Gandhi's Be Magazine, say in their article about Spirituality 103: Dr. Ivan Figueroa-Otero writes of a journey of love, compassion, and forgiveness we must all take as we truly embrace our inner Warrior of Light. It is easy to identify the 'enemies' out there, but real change will not show up [...] until we transform the 'enemy' we have created within, and often over the course of a lifetime. This is the power of forgiveness and reconciliation that Mahatma Gandhi taught us in his philosophy of nonviolence and this is the deep lesson of forgiveness and reprogramming that Dr. Ivan Figueroa-Otero so eloquently introduces us to in Spirituality 103." Spirituality 103 will be distributed by Balboa Press, a division of Hay House, and is expected to be available on April, 2017. For more information about Spirituality 103 visit: http://www.ivanfigueroaoteromd.com. You can also call Dr. Figueroa-Otero at: 1-787-728-6032 or write to: ifiguero(at)prtc(dot)net. Espiritualidad 101 Para Los Colgaos En La Escuela De La Vida.